For those who are interested in obtaining a general understanding of water rights law, we provide the following summary below. The summary is not intended to be complete and should be viewed as legal information only, and not as legal advice. Those who need to apply it to a particular factual situation should seek the advice of this office or other qualified legal professionals, as the presence of subtle, seemingly inconsequential facts can significantly change the legal analysis. Please read our disclaimer. Generally speaking, there are two types of appropriative water rights recognized in California—pre-1914, and post-1914. In 1872, the California Legislature enacted sections 1410 through 1422 of the California Civil Code. These code sections were in effect until December 19, 1914, hence the name “pre-1914.” These sections established the procedure for fixing the priority of an appropriation of water. Generally, the person intending to obtain the right was required to first post a notice of appropriation at the proposed point of diversion and then to later record a copy of the notice with the appropriate County Recorder. If these procedures were not followed, the priority of the appropriative right did not attach until the water was beneficially used. (Duckworth v. Watsonville Water Co. (1910) 158 Cal. 206, 110 P. 927). Once acquired, a pre-1914 appropriative right can be maintained only by continuous beneficial use of the water. The right is not fixed by the amount claimed in the original notice of appropriation; the notice of appropriation really only fixes the date of priority. The amount of the right is fixed by the amount that can be shown to be actually beneficially used as to both amount and season of diversion. On December 19, 1914, the California Legislature adopted Division 2, Part 2 of the California Water Code. The enactment of Division 2 fundamentally changed the procedures for obtaining an appropriative water right. a. File an Application to Appropriate Water with the State Water Resources Control Board. b. File an Environmental Information form with the Application. c. Submit a map of the area (which may have to be drawn by a registered civil engineer depending upon the size of the appropriation sought). d. Include a $1000 application fee to the State Water Resources Control Board and an $850 application fee to the Department of Fish and Game. e. Enter into a Memorandum of Understanding with the State Water Resources Control Board for the preparation of environmental documents. 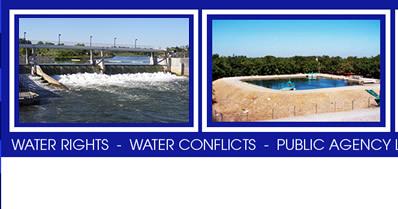 The application forms can be obtained from the State Water Resources Control Board, located at 1001 I Street, Sacramento, CA, or on the internet. The steps described above can become very complicated and any person who would like to apply for a water right should contact an attorney who is familiar with them. Supplying incorrect or incomplete information during these steps can forever prejudice a hopeful applicant and result in unnecessary costs or the denial of the application. There are two special subsets of appropriative water rights called a “small domestic registration,” and a “small livestock stockpond registration.” These “registrations” allow a person to obtain a permit for the appropriation of water, if water is available, for these uses as long as the amount of water sought does not exceed 4500 gallons per day or 10 acre-feet per year. The processing of these two types of rights is streamlined and does not normally require as much documentation as the typical appropriative water right application. Nonuse: Nonuse is different from abandonment. Nonuse simply means the failure to put the water to beneficial use for a period of five years. It is also called a "forfeiture." (Water Code Section 1241; Lindblom v. Round Valley Water Co. (1918) 178 Cal. 450; 173 P. 994, North Kern Water Storage Dist. 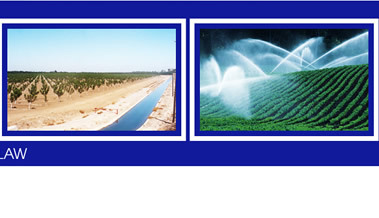 v. Kern Delta Water Dist. (2007) 147 Cal.App.4th 555, 54 Cal.Rptr.3d 578.). The riparian right arose, depending upon the historian consulted, from the Code Napoleon (Samuel Weil, Water Rights in the Western United States (3d ed. 1911)), or from early English common law (Arthur Maass & Hiller Zobel, Anglo-American Water Law: Who Appropriated the Riparian Doctrine? 10 Pub. Pol’y 109 (1961)), and it was later incorporated in the California Constitution. Generally, lands that are traversed or border upon a natural watercourse may be riparian. California Court cases hold that each riparian has a right that is “correlative” with other riparians. Thus, each must share the water from that source (Pleasant Valley Canal Co. v. Borror (1998) 61 Cal.App. 4th 742, 72 Cal.Rptr. 2d 1). The guidelines below outline the rights and obligations associated with a riparian right. a. The extent of lands having riparian status is determined by three criteria: (1) The land in question must be contiguous to the stream. The length of frontage is an immaterial factor. (2) The riparian right extends only to the smallest tract held under one title in the chain of title leading to the present owner. (3) The land, in order to be riparian, must be within the watershed of the stream. (Rancho Santa Margarita v. Vail (1938) 11 Cal.2d 501, 81 P.2d 533). b. As to any owner below the confluence of two branches of a stream, the drainage areas of both branches must be deemed to constitute a single watershed and the owner riparian to both branches. (Holmes v. Nay (1921) 186 Cal. 231, 199 P. 325). c. A riparian owner may, for the more convenient use of the water on his riparian land, go upon the land of another farther up the stream, with the consent of such landowner, and there divert the water for use upon the land below. (Turner v. James Canal Co. (1909) 155 Cal. 82; 99 P. 520). e. Riparian rights are not determined by past geologic formations but by the present natural topography. (Rancho Santa Margarita v. Vail (1938) 11 Cal.2d 501, 81 P.2d 533). f. A parcel of land loses its riparian status forever when severed from land bordering the stream by conveyance, unless the conveying document specifically reserves the riparian right. (Miller & Lux, Inc. v. J.G. James Co. (1919) 179 Cal. 689; 178 P. 716). g. The riparian right is neither created by use nor lost by non-use. (Lux v. Haggin (1886) 69 Cal. 255, 10 P. 674). h. If there is insufficient water for the reasonable beneficial requirements of all riparian owners, they must share the available water supply. Apportionment is governed by the circumstances of each case, including each owner’s reasonable requirements and particular uses. A riparian owner who uses water for domestic purposes (household use, watering of domestic animals, etc.) may take the whole supply over one who uses it for other purposes. (Deetz v. Carter (1965) 232 Cal.App.2d 851, 43 Cal.Rptr. 321). i. A riparian right may be lost through prescription. (See discussion below under Prescription.) (Pabst v. Finmand (1922) 190 Cal. 124, 211 P. 11; Pleasant Valley Canal Co. v. Borror (1998) 61 Cal.App. 4th 742, 72 Cal.Rptr. 2d 1). j. A riparian right is subject to those appropriative rights that were perfected, as the result of the diversion of water, prior to the date of vesting of the riparian right, which is when the grant from the United States government was obtained. Otherwise a riparian right is generally superior in right to an appropriative right. (Haight v. Costanich (1920) 184 Cal. 426; 194 P. 26; Pleasant Valley Canal Co. v. Borror (1998) 61 Cal.App. 4th 742, 72 Cal.Rptr. 2d 1). k. The riparian right cannot be transferred for use upon a nonriparian parcel of land. (Holmes v. Nay (1921) 186 Cal. 231, 199 P. 325). l. The riparian right does not apply to foreign water; i.e. water originating in a different water shed, or stored and released by another user. (Stevinson Water District v. Roduner (1950) 36 Cal.2d 264, 223 P.2d 209; Bloss v. Rahilly (1940) 16 Cal. 2d 70; 104 P.2d 1049). m. A riparian right does not grant the right to store the water for seasonal use (generally greater than 30 days). (Colorado Power Co. v. Pacific Gas & Electric Co. (1933) 218 Cal. 559; 24 P.2d 495). Generally speaking, the priority of an appropriative water right is “first in time, first in right;” therefore an appropriative water right is subordinate and subject to all prior vested rights, whether appropriative or riparian. Prescription is a legal doctrine that allows a water user to overcome a prior water right held by another. Thus, if a junior water right holder diverts water that is lawfully entitled to a senior water right holder, the junior may become entitled to that water if the diversion satisfies a number of requirements. First, the use by the junior must be continuous and uninterrupted for a period of five years. Second, during those five years, the use must be open and notorious, exclusive, under claim of right, hostile and adverse to the title of the senior owner, and an invasion of the senior owner’s right. Third, the senior owner must have had an opportunity to prevent the adverse use by legal action, and any taxes that are assessed on the water must be paid by the junior. Absence of any of these conditions is fatal to the acquisition of a prescriptive water right. Water users are ordinarily not concerned with the use of water by others after it has passed their land or point of diversion. Thus, a prescriptive water right ordinarily cannot be acquired against an upstream user. A right cannot be acquired by prescription to use a greater quantity of water than is reasonably necessary for the beneficial purpose served, regardless of the amount actually used. It is important to note that the prescription doctrine described above relates as between two fully permitted appropriative water right owners, or a riparian or permitted appropriative water right owner. It is currently unclear whether an unpermitted appropriative water right user can obtain a prescriptive water right against a permitted water right holder or riparian. Since enactment of Division 2, Part 2 of the California Water Code, a right to appropriate or use water cannot be secured without first obtaining a permit from the State. However, this right may only apply as against the State, and may not be required to obtain a right against another lawful user. (People v. Shirokow (1980) 26 Cal.3d 301). Pursuant to Water Code Section 1702, vested appropriative and riparian rights cannot be impaired by the issuance of a new water right. A permit, if issued to the applicant, will limit the water to be appropriated so that the new permit will not injure existing rights. The priority of the right acquired will be the filing date of the application. The right to use water is a “usufructory” property right and is protected in a number of ways. The individual who believes their water right is being infringed upon may file a complaint with the State Water Resources Control Board (the “Board”), or may institute court action. The Board, if consulted, may investigate and possibly fine the wrongful user if it finds that an individual is using water unlawfully. If a suit is instituted in court, the court may enjoin the wrongful user, or it may award damages to the rightful user of the water if it finds that an individual is using water in a manner that is wrongfully denying another the use of the water. Note that the Board will not become involved in a dispute concerning the validity or exercise of a pre-1914 or riparian right, only a court of competent jurisdiction may do so. Generally, the Board’s authority to determine the validity of a water right extends only to appropriative water rights initiated post-1914, unless petitioned by one or more claimants to engage in a statutory stream adjudication, in which case the Board is empowered to determine all rights to water of a stream system whether based upon appropriation, riparian right, or other basis of right. (California Water Code § 2501). Such adjudications are extraordinarily time consuming and expensive. Jurisdiction over groundwater is generally left to the county within which the groundwater lies. The jurisdiction of the State Water Resources Control Board extends only to surface water and subterranean streams flowing through known and definite channels. (Water Code § 1200). Generally, landowners have the right to withdraw water from an underground aquifer for reasonable beneficial use on their overlying land. This right to withdraw water is correlative (similar to a riparian right holder’s) with all the other landowners overlying the same aquifer. With respect to a spring which has no natural outlet, the owner of the land in which it lies, under ordinary circumstances, owns the water as completely as he does the soil. (State of California v. Hanson (1961) 189 Cal. App. 2d 604; 11 Cal. Rptr. 335). Such water may be used without obtaining a permit from the State Water Resources Control Board; however, a Statement of Water Diversion and Use should be filed with the Board. If a spring contributes to a flowing stream, a permit from the State Water Resources Control Board must be obtained, unless the water can be used under a riparian water right. The “public trust” is a legal concept imported from Roman law into English common law. From this origin in Roman law, the concept of the public trust evolved, under which the federal government owns all of its navigable waterways and the lands lying beneath them as trustee of a public trust for the benefit of the people. The states acquired title as trustees to such lands and waterways upon their admission to the union (supra.) Historically, the trust applied only to navigation and similar uses in navigable waterways. However, in National Audubon Society v. Superior Court of Alpine County (1983) 33 Cal. 3d 419, 189 Cal.Rptr. 346, the California Supreme Court expanded the trust to include public interests in non-navigable waterways. Thus, the scope of the public trust in California is very broad. Any use of surface water in California is theoretically subject to the public trust. In addition, any member of the general public has standing to raise a claim of harm to the public trust. The harm alleged can be based upon a number of factors, which include aesthetics, fishery, ecological disruption, etc. If successfully argued, the application of the public trust can, in effect, amend or modify a water right. This information does not represent a complete discussion of all the issues relating to water rights. Do not rely on the information contained in this web site. Since every individual's factual situation is different, and can significantly affect the legal analysis, independent legal advice regarding specific situations from a licensed attorney familiar with water law is strongly encouraged. Gallery and Barton, a Professional Law Corporation and its attorneys make no claims, promises, or guarantees about the absolute accuracy, completeness, or adequacy of the contents of this web site and expressly disclaim liability for any errors and omissions in the contents. No warranty of any kind, implied or expressed, or statutory, including but not limited to the warranties of rights, title, merchantability, fitness for a particular purpose, and freedom from computer virus, is given with respect to the contents of this web site. Mr. Barton is only licensed to practice law in California, therefore the information contained in this web site would not be applicable to water right issues located outside of California. Nothing in this web site shall be construed to create an attorney-client relationship. Nothing sent to this law office via e-mail shall constitute an attorney-client relationship. Nothing contained in this web site shall be construed to be a guarantee or prediction of result.